We believe in ghosts. Do you? Expecting the usual? Please don’t. You won’t find haunted houses, spirit infested graveyards, demonic poltergeists, or possessed objects in these pages. It’s been said that there are no haunted places, only haunted people. That’s who you’ll find here, the haunted ones. A maintenance technician in Antarctica, an English thief, a young couple on a road trip across America, an astronaut on a one way ride to Jupiter, an Irish gravedigger, and dozens more. 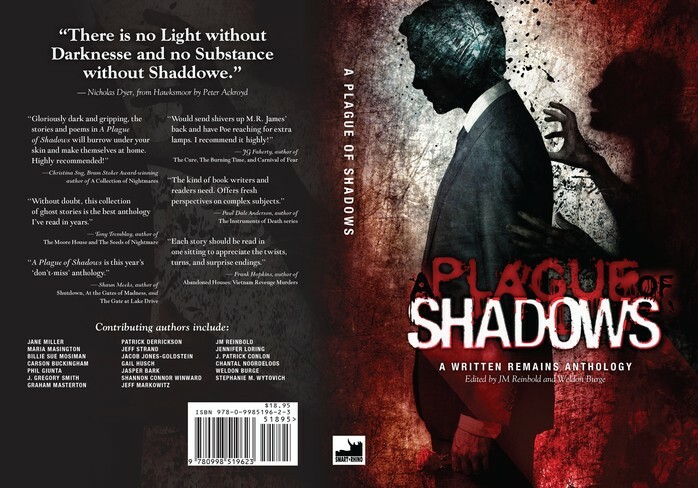 All victims of an otherworldly infection, all tormented by a plague of shadows. Do you believe in ghosts? You will. This anthology includes stories and poetry by the members of the Written Remains Writers Guild, as well invited, renowned guest authors, and was edited by JM Reinbold and Weldon Burge. "Without a doubt, this collection of ghost stories is the best anthology I've read in years." "Would send shivers up M.R. James' back and have Poe reaching for extra lamps. I recommend it highly!" "The kInd of book writers and readers need. Offers fresh perspectives on complex subjects." 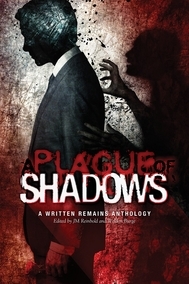 "A Plague of Shadows is this year's 'don't-miss' anthology." The illustration for the cover was created by Tomoki Hayasaka. Cover design by Ju Kim. If you enjoy ghost stories and horror fiction, this is a "don't miss" anthology! And be sure to check out our other Written Remains Writers Guild anthology, Someone Wicked.